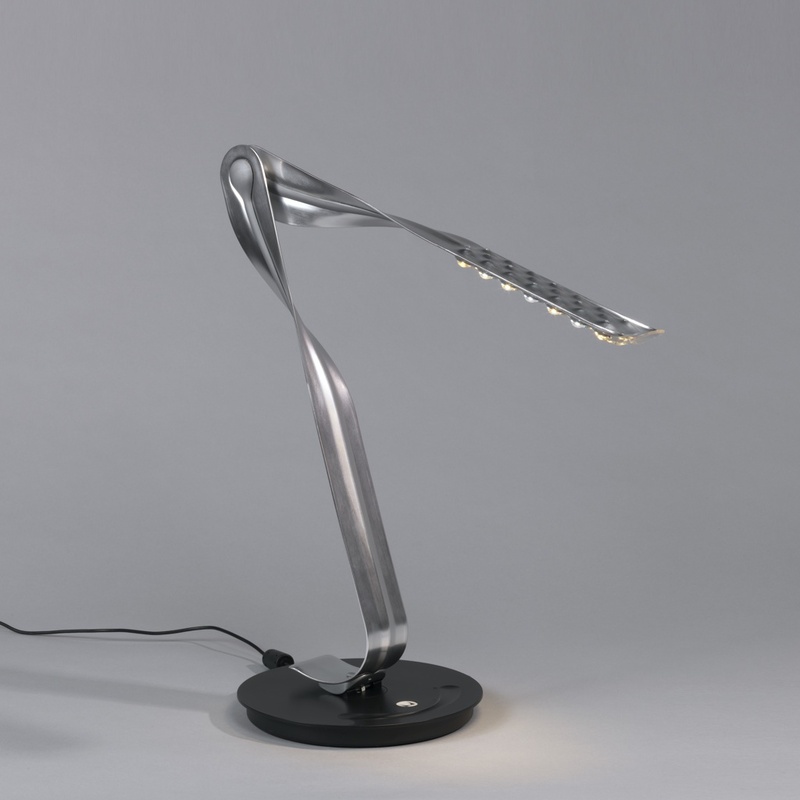 See more objects with the tag lighting, offices, sculptural, twisted, leaves, movable. 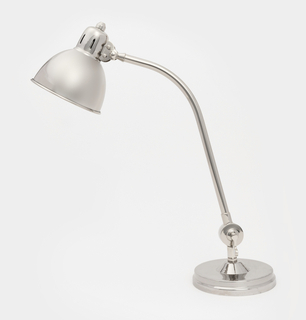 This is a Task lamp. It was manufactured by Herman Miller, Inc. and firm: fuseproject. We acquired it in 2006. Its medium is aluminum, plastic, rubber, led. It is a part of the Product Design and Decorative Arts department. Yves Béhar, a Swiss-Turkish designer, was the 2004 National Design Award winner in the category of Product Design. Based in San Francisco, Béhar and his firm, fuseproject, have rapidly become recognized for blending design and brand development and for designing objects based on a conceptual narrative inspired by the user’s experience. Béhar’s body of work spans products from footwear, such the Footprints line for Birkenstock (2003), to high tech gear like the award-winning Aliph Jawbone noise-reduction cell phone headset (2004). The Leaf task light was created primarily for the consumer market. Herman Miller, inspired by Béhar’s belief that a user’s emotional connection to a product is essential to design, approached him to collaborate on the development of a new lighting concept. Other designers who have worked with Herman Miller include Gilbert Rohde, Charles and Ray Eames, and George Nelson. Although Herman Miller is now primarily known for office furniture systems, many of their consumer designs, like the Eames lounge chair, have become modern classics. Prior to the collaboration with Béhar, Herman Miller’s last consumer lighting design was Nelson’s Bubble lamp range, introduced in 1952. Leaf is an effort to revive consumer lighting with 21st-century concerns in mind: socially responsible design, ease of use for a broad range of users, environmental sustainability, and energy conservation. Béhar and Herman Miller product development team leader, Marc Gierz, first experimented with fluorescent, halogen, and cold cathode light sources before trying chip-based Light Emitting Diode (LED) technology. Early LEDs were red but, by 2004, chip makers had broadened the light color spectrum to produce a range from cool white to warm white. Working with Nichia Corporation, the Japanese company that invented LED technology, Béhar and the Herman Miller team further developed the technology and devised the LED unit used in Leaf. The grid of LEDs sits on the underside of one of two thin, curving, leaf-like aluminum blades. The sculptural metal form is designed to minimize use of material and mechanical complexity. The blades are hinged, allowing the top blade with the LEDs to pivot so the user can position the lamp up for direct light or down for ambient light. The innovative LED unit consumes less than 12 watts of electricity, has a lifespan of over 60,000 hours at full power, and reduces energy use by 40% compared with compact fluorescent lights. To reduce the intense heat produced by LEDs, Béhar came up with another innovation: small “chimneys” above the chips that dissipate heat and keep the lamp cool. The low, smooth, circular base houses complex circuitry that the user controls by touch. The user modulates light intensity and temperature simply by sliding a finger along the two curved, tapering troughs. The on/off control is a small touch-sensitive circle. By varying both light temperature and intensity, the user can simulate the soft yellow glow of candlelight or choose a more intense incandescent- or fluorescent-like light appropriate for tasks such as sewing, reading, or working at a computer. 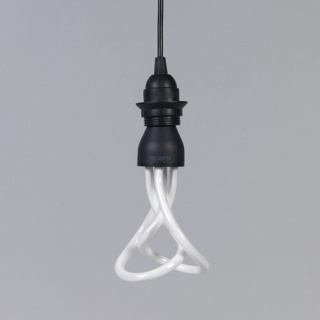 Leaf would be the first example of 21st-century lighting in the collection and the first example of Béhar’s product design in the collection. It would also be an excellent addition to the museum’s Herman Miller holdings that, at the time of proposed acquisition, include about a dozen examples of furniture, primarily by the Eames, and the innovative Aeron chair (1994). This object was donated by Herman Miller Furniture Company. 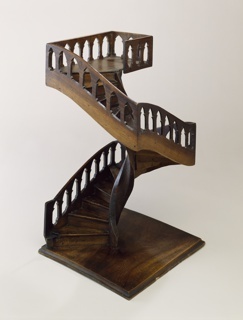 planed and carved walnut and fir.